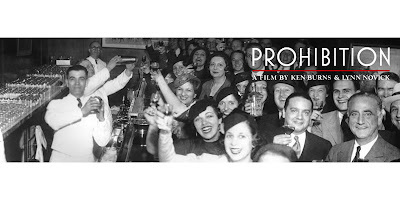 "PROHIBITION is a three-part, five-and-a-half-hour documentary film series directed by Ken Burns and Lynn Novick that tells the story of the rise, rule, and fall of the Eighteenth Amendment to the U.S. Constitution and the entire era it encompassed. Prohibition turned law-abiding citizens into criminals, made a mockery of the justice system, caused illicit drinking to seem glamorous and fun, encouraged neighborhood gangs to become national crime syndicates, permitted government officials to bend and sometimes even break the law, and fostered cynicism and hypocrisy that corroded the social contract all across the country." Part 1 "A Nation of Drunkards" describes how immigration, alcoholism, women's suffrage and the temperance movements led up to the passing of the 18th Amendment, Prohibition. Part 2 "A Nation of Scofflaws" addresses how the enforcement of Prohibition was inconsistent and caused unintended consequences, including making criminals of a large portion of the population. Part 3 "A Nation of Hypocrites" follows the gradual swing towards repeal of Prohibition as the Great Depression focuses attention on other priorities. Watch Prohibition Sneak Peek on PBS. See more from Ken Burns.